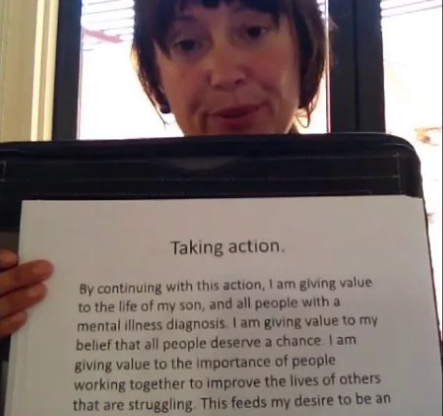 Welcome to this presentation from central Australia by Amanda Worrall, in which she discusses the skills and knowledges of parents in circumstances in which a child is diagnosed with schizophrenia. We’ve also included a paper by Amanda on the same topic. Thanks for your responses! They are very much appreciated. Troy, a scaffolding question…good one. I’m casting my mind back over 2 years ago, and whilst i cannot remember any specific details, i do remember that the turning point was externalising ‘shame’ and talking about the various discourses that invite in shame, parent blaming etc. Having a convernsation about these various discourses shifted the energy and focus away from self blame. The parents were very validating of each other,and this was much more powerful than anything i contributed…this supported them in these conversations. Specific details, i struggle to remember those…i need to start recording sessions much more – thanks for the inspiration! Just loved going with you through each step you took and your thinking from meeting the parents (some again) and putting your skills to work to the descriptions of the parents’ skills, knolwedge and new views o fhtemselves and their actions. So easy to learn with you. One aspect that stands out is the way you put the agency of the people you are meeting with before the skills and understandings from Narrative. Might seem a strange thing to say but I noticed this in another presentation you did and it has stayed with me. It is as if those skills and ideas are readily available to you but you wait / there’s a pause and you (seem to) listen and THEN select from the rich resource of possibilites at the service of the people you are working with. Another aspect is the clarity in what you are doing: crafting questions, externalising, re-authoring… I relate both of these to a “de-centred position”, this is very visible in your description of your work. Makes “de-centred” quite a tangible. Thanks Lovely to see youain and more of your work. Thank you for sharing this wonderful video. The work on externalizing and finding unique outcomes to ‘Shame’ was particularly resonant for me. A few colleagues and I have been doing some work at a high school in which we have been encouraging the young people to express themselves in collective and creative ways about particular values, stories and issues. The students have done some wonderful work but at times Shame does step in and it seems to affect some students more often than others. We have been working hard to offer lots of different opportunities and ways to be involved, but I am thinking we might be able to assist the students more if we were to tackle this Shame idea externally. Many thanks to you and the people in the parent group for providing the inspiration for this. Could I ask, were there any particular things you did to scaffold the conversations or make people feel comfortable to talk in the face of Shame?